Samsung Electronics and its affiliates will engage in a groupwide campaign to reduce use of plastics and disposables at the workplace to join global moves of cutting plastic consumption and protect the environment, the company said Tuesday. The electronics unit said the current campaign at the company, Samsung SDS and Samsung Electro-Mechanics will be expanded to Samsung Display, Samsung SDI, Samsung C&T and Hotel Shilla. 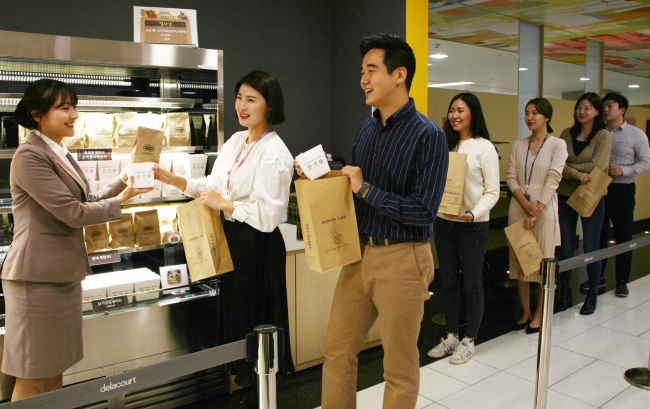 At the affiliates’ cafeterias, plastic and vinyl materials for takeout food will be replaced with reusable paper, disposable spoons and forks will no longer have plastic covers, the to-go beverage menu will be trimmed and employees will be encouraged to carry reuseable bags. Samsung expects such campaign efforts to help cut 36 metric tons of plastic used every month, for a total of 432 tons a year. At offices, employees will be recommended to use mugs instead of disposable cups and increase the use of refillable goods. Hand dryers will be installed in restrooms and umbrella dryers at lobbies. “At each affiliate, consultative bodies for employees will launch separate campaigns to encourage workers to actively participate in the group-level campaign,” a Samsung official said.